lt;stronggt;RCP1835529lt;/stronggt;lt;BR/gt;Rubbermaid Pulse Mopping Kitlt;BR/gt;Clean floors in record time with a high-capacity mopping system. A refillable reservoir cleans up to 850 square feet without stopping. Ergonomic trigger handle allows comfortable and convenient cleaning, dispensing three streams of solution with each squeeze. Absorbent microfiber pads help achieve a thorough clean. 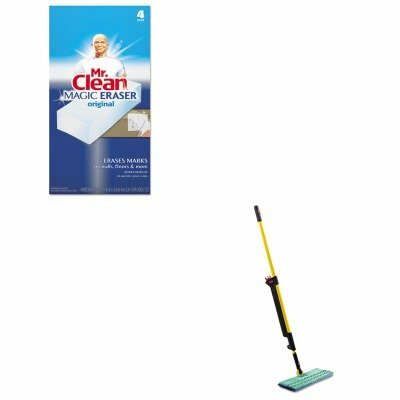 Lightweight mopping kit is portable and easy to carry, weighing only four pounds when filled with solution. Application: Floors Mop Head Size: 17-1/2quot; Wide Handle Length: 52quot; Mop Head Color: Blue.lt;BR/gt;lt;BR/gt;lt;stronggt;PAG82027lt;/stronggt;lt;BR/gt;Rubbermaid Pulse Mopping Kitlt;BR/gt;Disposable, soft pads erase set-in dirt and grime quickly and easily. They remove scuff marks, dirt and tough crayon marks from floors, walls and doors. Safe to use no gloves or chemicals necessary. Application: Doors Floors Walls.